Congratulations, you are now parents to a warm little bundle of joy! Being new parents comes with a range of emotions varying from worried and scared to excited and overprotective. You can’t stop yourself from fussing over everything at home; the onesies, the diapers, the baby products, and baby’s sleeping arrangements. As precious as your newborn is, for parents, having a peaceful night of sleep can now seem like a distant dream. Even if you are past the waking up every few hours for feeding phases, soothing a fussy baby to sleep is a tough task. To help your baby sleep better at night, paediatricians often recommend relaxing activities such as warm baths. But when nothing seems to work, parents might turn to alternative options like white noise machines baby can relax with. A white noise machine is a device which mimics comforting sounds like a serene waterfall, wind blowing, birds chirping etc. to soothe your baby to sleep. With the growing popularity of white noise machines, we have made you a list of the Best Baby Sound Machines available in the market. Here we list for you the pros and cons of each device to give you an idea of what to expect. 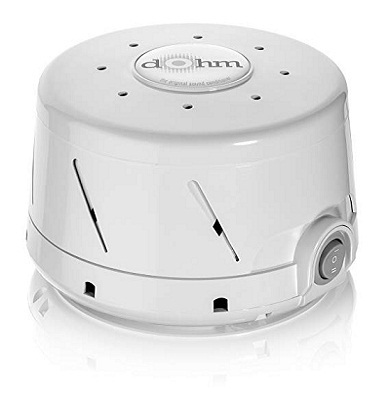 Help your baby sleep well with this Marpac Dohm Classic baby white noise machine. Its classic fan-based natural and unobtrusive sound fades into the background and then masks noises that might otherwise wake the baby. With two adjustable speed options, it gives you the flexibility to set the volume needed for the baby’s environment and sound masking requirements. This model is the official white noise machine of the National Sleep Foundation, and it creates the sound of rushing air without causing a sleep-disrupting airflow. Its small and basic design fits anywhere making it conveniently compact. It produces rich and high-quality sound. Sound can be customized to the most relaxing setting. It’s easy to use with no complicated interface. The device provides only 2 sound masking settings. It is not portable as it needs to be plugged in at all times for power. Dohm’s high-quality acoustic sound is comforting as compared to other sound machines’ digitally recorded white noise, which can sound irritating. Let your newborn get a good night’s sleep with the Portable Compact Baby Sleep Soother Owl by SOAIY. 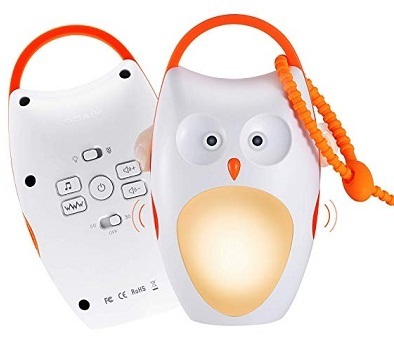 An adorable, owl-shaped noise shusher which is perfect for outdoor using and travel. It is portable, battery operated with 7 different sounds (4 natural and 3 lullabies). A warm and soft night light helps soothe the baby in darkness without being harsh on the baby’s eyes. It is powered by two AA batteries. Its powered by batteries and doesn’t require a plug-in power source. An inbuilt 7-inch strap that allows it to attach to car seat, stroller, or a chair. It 7 sound settings with adjustable volumes. 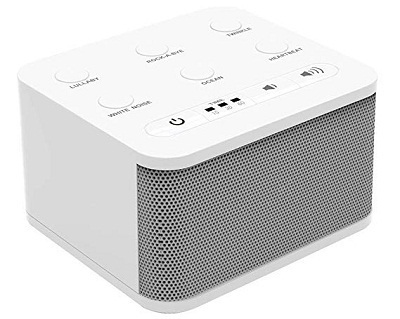 One of the most affordable white noise machine. The sound quality may not be too great. It is a perfect lightweight device having many features at an affordable price point. SoundBub is a Bluetooth-enabled portable speaker and one of the best white noise machines for babies designed to be a convenient aid for active parents and a soothing, fun companion for your little one. Merely press the bear’s belly button to activate the built-in white noise and watch your child drift off to a peaceful sleep. You can play music your child loves by connecting any Bluetooth-enabled device. The SoundBub is chew-safe and best for newborns. A rechargeable lithium battery powers this white noise machine. Bluetooth enabled portable and rechargeable speaker. Has 12 inbuilt white noise sounds. Includes timer settings and a continuous play option. Requires frequent charging due to lesser battery back up. Benji, the Bear by SoundBub, can be easily recharged through micro-USB cables. Additionally, you can download more soothing sounds as per the baby’s liking via the VoiceShare app. You can create an ideal sleep environment for your baby wherever you go with the myBaby SoundSpa Portable Machine. With these sound machines, baby can relax and sleep well through the night. You can choose from 6 soothing sounds, including heartbeat, white noise, ocean, summer night, thunderstorm and brook. What makes it unique is its dual charging option: it can be either an adapter or battery operated (requires 4 AAA batteries) according to your convenience. Availability of auto-off timer options: 15, 30, or 60 minutes. Soft and natural sounds are tender to the baby’s ears. It is portable and lightweight which comes handy during travel. Both battery and adapter operated which makes it flexible and convenient. Batteries not included with the package. The myBaby Portable SoundSpa has been proven to be useful for both babies and adults alike. Now you can enjoy full nights of uninterrupted sleep along with your little munchkin. 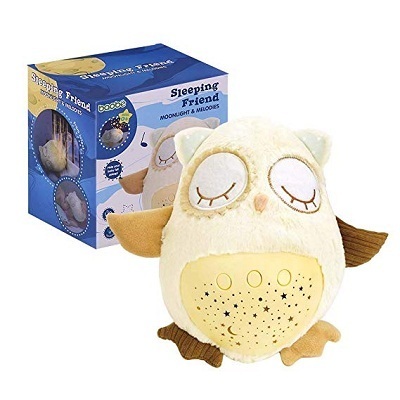 Gift your baby this little plush buddy and enjoy a little extra peace during bedtime with the Sleep Soother Owl white noise sound machine. You can select from 8 meditative songs and amniotic fluid sounds that will help your baby relax and drift off peacefully. The soft night light setting projects a colorful galaxy of moon and stars in 3 soft color options: blue, green and amber which soothes and makes the baby feel safe in the dark. It is powered by 3 AAA batteries. Soft light projector helps calm the baby in the dark. Can be used as a cuddly soft toy companion for the baby. Cannot be attached to a crib or car seat. 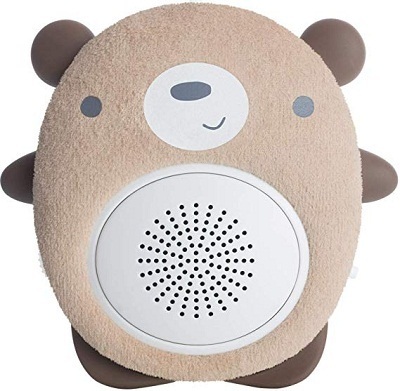 You will love the dual purpose served by this device: a plush toy your child can play with and a white noise machine to lull the baby to sleep. 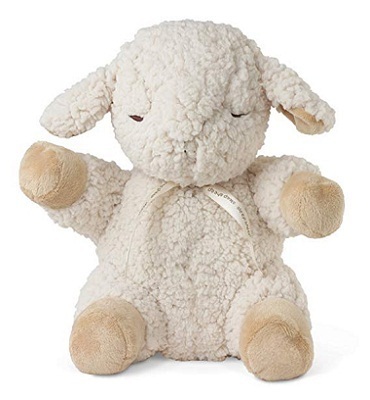 This is shaped like a cute, cuddly, little lamb with a hidden baby noise maker that plays white noise to soothe your child into a restful, relaxing sleep. Soft and cuddly, Sleep Sheep will be your child’s favorite stuffed playmate during the day, and your favorite sleep solution at night. It has 8 soothing sounds and melodies and has been scientifically proven to promote better sleep. It comes with a removable sound machine and can be machine washed whenever needed. It is portable and battery operated (powered by 2 AA batteries). It can be easily attached to a crib or a bed with a velcro tab attached to the head. It is machine washable once batteries have been removed. Sleep Sheep shuts off to save battery power after choosing the 23 or 45-minute option. Due to the availability of only 2-time settings, babies are prone to waking up after it shuts off. It does not offer an option to leave it on indefinitely. Winner of many industry awards including the National Parenting Council’s Seal of Approval and the iParenting Media Award, its easy operation and washable nature makes it a top favorite among parents. 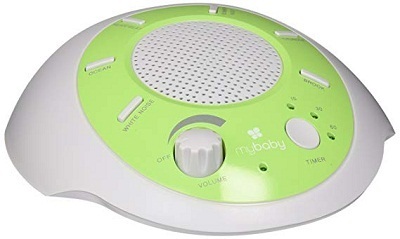 This product is the best sound machine for baby – a unique and top-rated product which uses doctor-tested and approved rhythmic shushing technique to calm a fussy baby. Its tested technique breaks a baby’s cry spell by mimicking a rhythmic shush which reminds the baby of being inside the womb. It is battery operated, small, compact and easy to clean making it great for travel. Its 15 to 30-minute timer provides long shushing sessions which put even the fussiest of babies to sleep. It is powered by 2 AA batteries. It can be easily attached to your hand via the wrist strap which makes it easy when you are carrying the baby. It is clinically tested, and doctor approved which makes it a safe buy. The adjustable volume setting soothes the baby at night without keeping everyone awake. The price of the Baby Shusher is a bit on the higher side. Nothing affirms trust more than a doctor tested and certified product. The Baby Shusher uses a parenting technique made popular by Dr. Harvey Karp in the book ‘Happiest Baby on the Block’. Your baby will love falling asleep to the rich, high-quality natural sound produced by the Big Red Rooster Baby White Noise Machine. It has a “deep” sound which effectively drowns out other sounds to caress your baby to sleep better and wake up refreshed. It has 6 high-quality lullabies and sleep sounds: heartbeat, lullaby, ocean, rock-a-bye, twinkle and white noise. Its compact size makes it portable. Just like the myBaby SoundSpa, the Big Red Rooster comes with dual charging option: adapter and battery operated. It is powered by 3 AA batteries. It has a high-quality soothing sound compared to other machines in the same price range. It comes with an ‘Always On’ option and 3 different timer settings. It comes at an affordable price point. The buttons are a little loud when changing the noise level setting which can wake the baby up. No straps/ option to attach it to a crib or car seat. The Big Red Rooster is straightforward and budget-friendly toddler sound machine which has proven to be beneficial in calming the baby. This will be an ideal buy if you are looking for a no-nonsense good product for your baby. As you can see, the best white noise machine for the baby will vary depending on your needs. However, the best white noise machine for a baby should have a variety of different sounds and volume levels and crisp sound quality. The power source can also be relevant as some parents want one both for home use and travel, as well as the design – some are classic sound machines that can be placed on a nightstand or table, while others are shaped like cute, fluffy animals so the baby can cuddle with them. Babyhood can be overwhelming for both infant and mother, and we hope that we have eased a tad bit of the tension by bringing you this well-thought and studied list of remarkable white noise machines that are available in the market. Babyhood can be overwhelming for both infant and mother, and we hope that we have eased a tad bit of the tension by bringing you this well-thought and studied list of remarkable white noise machines that are available in the market.